Cast bronze (approx. 83 percent copper and 17 percent tin). Given by Commander C.McLaughlin, R.N. 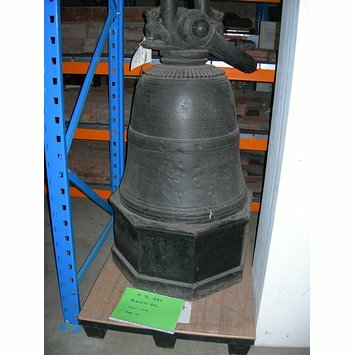 Traditional dome shaped bell flaring slightly at the base. Decorated in relief on the shoulder with a ruff and concentric rings design; an edged band around the waist and concentric rings around the base. A swinging shackle is attached to the holding ring which is embellished on either side with a pair of seated chinthei (Two grotesque guardian lions). From shoulder to waist the bell is circled with lines of Burmese text - part of which states that the bell was donated by Ye Wun (water transport minister) Nay myo min hla kyaw swa. The bell is dated 1189 BE (1827 AD) and the maker is Maung Myat. Trans. Daw San San Maw of the Archaeological Department; Rangoon; Burma; 1992. 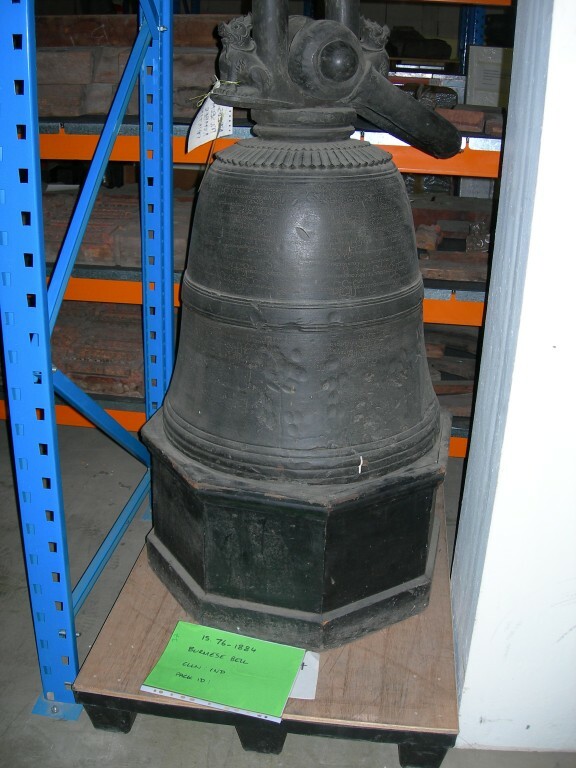 Historical significance: Bells of all sizes were presented as an act of merit to a pagoda or monastery.